In terms of lawn care, zone 6 of the U.S. Department of Agriculture's plant hardiness zone map is considered a transition zone, with hot summers, cold winters and wet and dry periods throughout the year. While these weather conditions can be challenging, a regular maintenance schedule will keep a zone 6 lawn looking its best throughout the growing season of early spring to fall. Grass seed can be a challenge for zone 6. Traditional warm- or cool-season grasses do not do well in this area. The best bet is to choose a grass that handles temperature extremes such as a cool-season grass that handles the heat or a warm-season grass that can handle the cold, suggests Neil Christians and Ashton Ritchie in the book, “Lawns.” Examples include Bermuda grass, a warm-season grass available in cold-tolerant varieties and a mix of cool-season grasses such as Kentucky bluegrass, perennial ryegrass and tall fescue that can handle the heat. For cool-season grasses, fall is the best time to sow grass seeds because the ground is still warm enough to speed up germination, but the weather is cool so the grass starts to grow. Early spring is the second-best time to sow seed, according to “Jerry Baker's Green Grass Magic” by Jerry Baker. The best time to lay cool-season sod is mid- to late-spring, right before the weather turns hot. If using warm-season grass, sow grass seed in the spring when the temperatures are consistently warm during the day. These types of grasses need warm weather to grow. 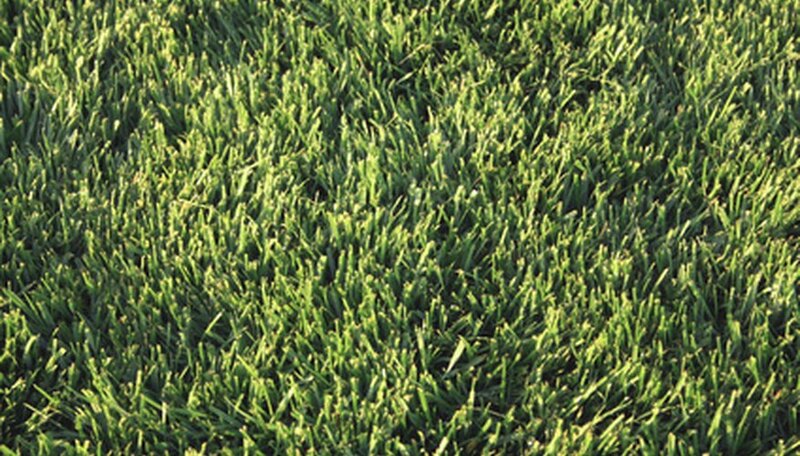 Lay warm-season sod during either the early spring or early fall. Apply pre-emergent herbicides in the spring on both warm- and cool-season grasses to control crabgrass. These types of herbicides work against the germinating seeds to prevent the weed from sprouting, according to “Lawn Care for Dummies” by Lance Walheim and the editors of the National Gardening Association. Apply post-emergent herbicides on broadleaf and narrowleaf weeds, such as dandelions, that are already growing. There are two types of post-emergent herbicide: contact, which kill only the part of the plant it touches, and systemic, which is absorbed by the plant, killing it slowly. Ensure both warm- and cool-season grasses receive a half-inch of water twice a week. This amount includes any rainfall, so keep that in mind during rainy weeks. The rule on watering is to water deeply and frequently to keep the root zone moist, according to “Lawns and Ground Covers” by Time-Life Books. Ensure the water is reaching the roots by digging up a core of soil and checking. If the climate is unusually dry, more water will be needed. A visual clue is that the grass will appear wilted and take on a dull gray-blue color. The general rule about mowing height is not to cut more than a third of the grass blades in a single mowing session, according to John Fech in “Tauton's Lawn Guide.” The best way to do this is to use a ruler to measure the grass before and after mowing to get a feel for what the grass looks like when it needs to be mowed. In the heat of the summer, raise the height of the mower blades 20 to 30 percent to allow the roots to grow deeper and supply the blades with water. Re-measure with the ruler before cutting and then afterward, to ensure only a third of the grass is cut. When to fertilize depends on what type of grass you have. For cool-season grasses, Fech recommends fertilizing four times a year: April 15, Memorial Day, Labor Day and Halloween. For warm-season grass, fertilize three times: two weeks after the lawn has turned green, Memorial Day and July 4.